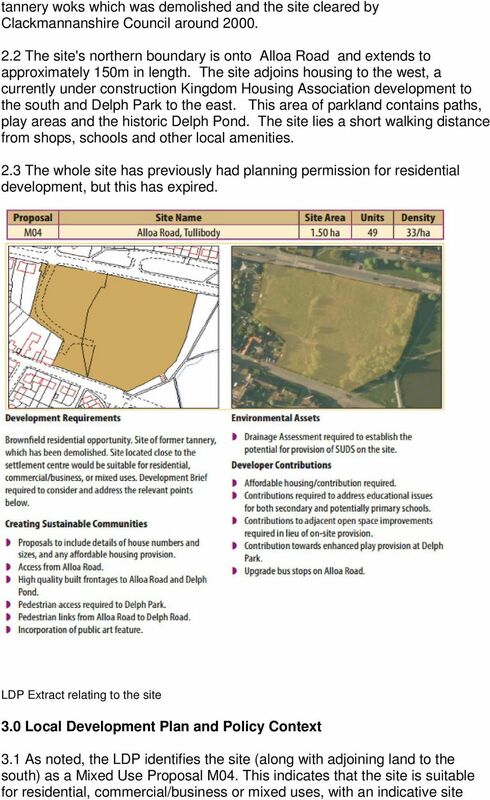 Download "DEVELOPMENT BRIEF FOR LAND AT ALLOA ROAD, TULLIBODY"
6 size of vehicle anticipated to access the site can safely enter, turn and leave. The largest size of refuse vehicle currently operated by the Council is 10.35m long. 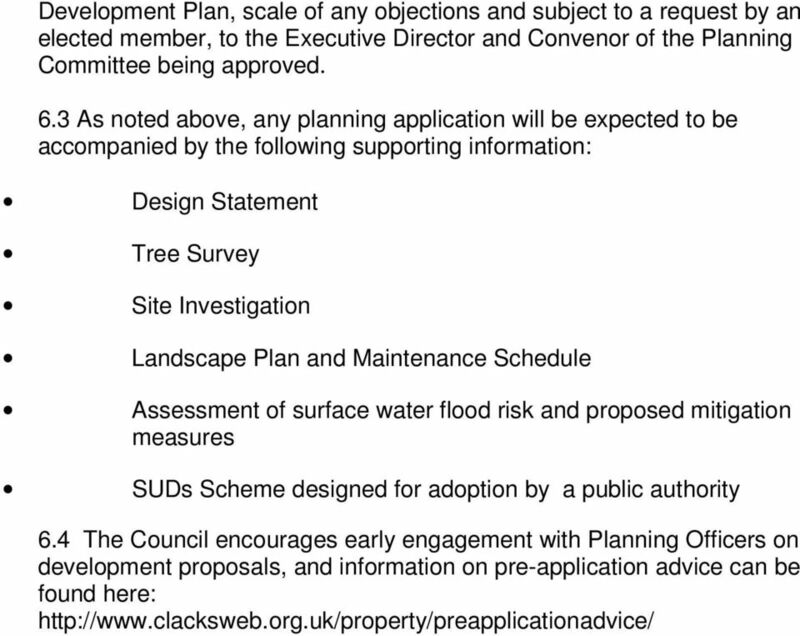 Design and Density 4.7 Development density will to a large extent be determined by whether there is a mix of uses proposed and the nature of any housing development. The LDP provides an indicative figure of 49No. 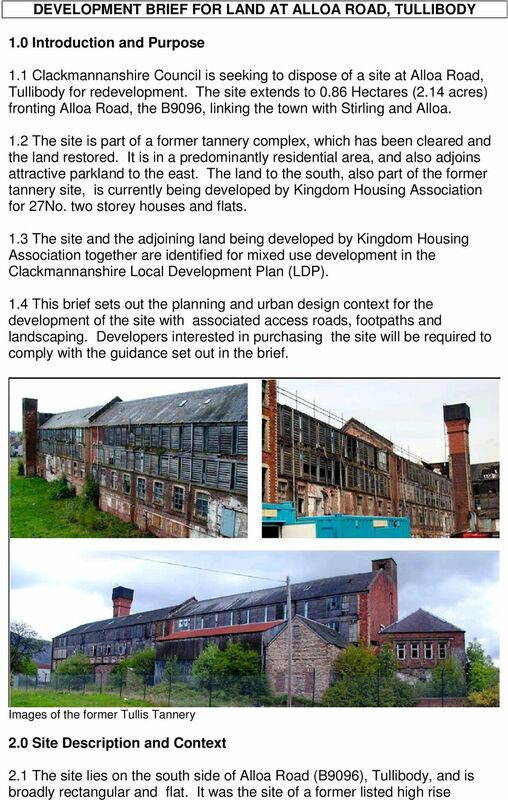 units for the site, but this also includes the land to the south, currently being developed by Kingdom HA. That development comprises 27No. social rented houses and cottage flats and has a density of approximately 45 units per hectare. 4.8 It should not be assumed that the site is only available for the balance of the 49No. 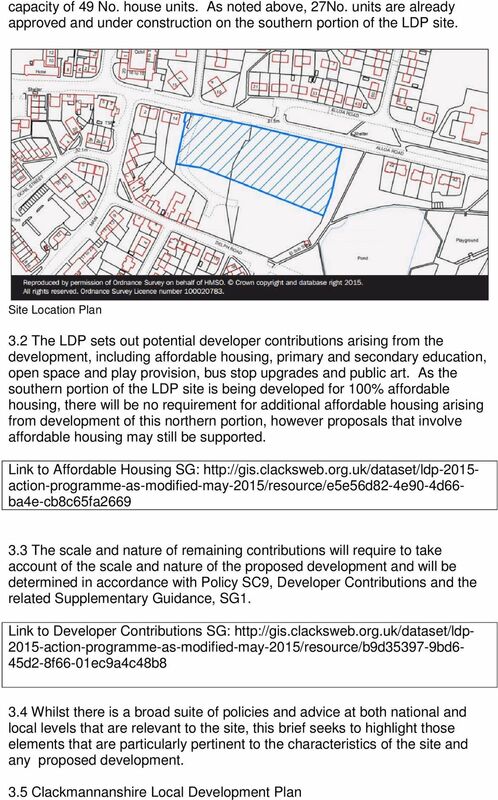 units proposed for the whole LDP site. Density should be appropriate to the site and surroundings, and ensure provision of good quality, useable communal and private space. Alloa Road Frontage 4.9 There should be no direct vehicle access from houses in the site into Alloa Road, but houses on this frontage should be designed and orientated to the road frontage. 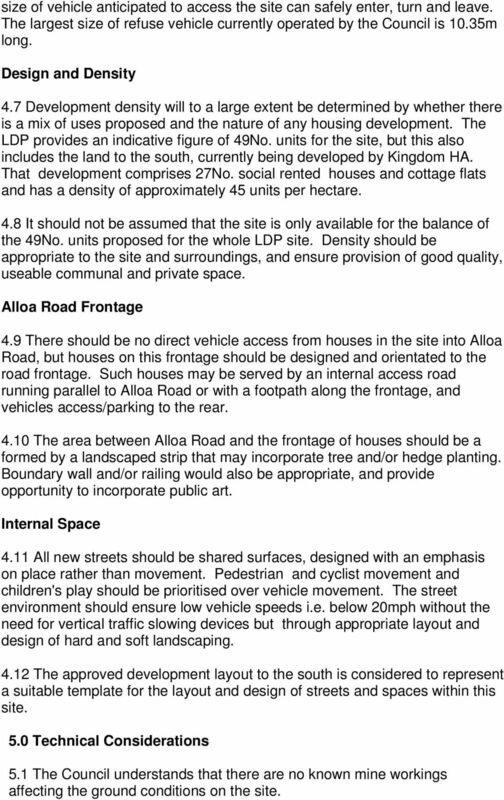 Such houses may be served by an internal access road running parallel to Alloa Road or with a footpath along the frontage, and vehicles access/parking to the rear The area between Alloa Road and the frontage of houses should be a formed by a landscaped strip that may incorporate tree and/or hedge planting. 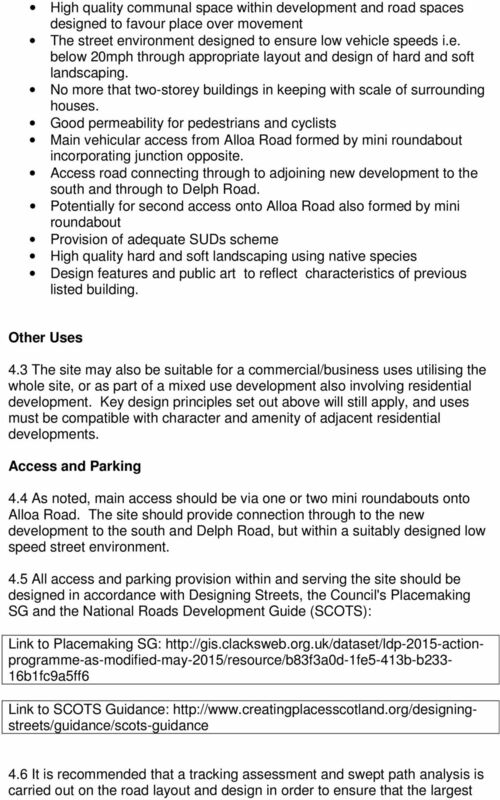 Boundary wall and/or railing would also be appropriate, and provide opportunity to incorporate public art. Internal Space 4.11 All new streets should be shared surfaces, designed with an emphasis on place rather than movement. Pedestrian and cyclist movement and children's play should be prioritised over vehicle movement. The street environment should ensure low vehicle speeds i.e. 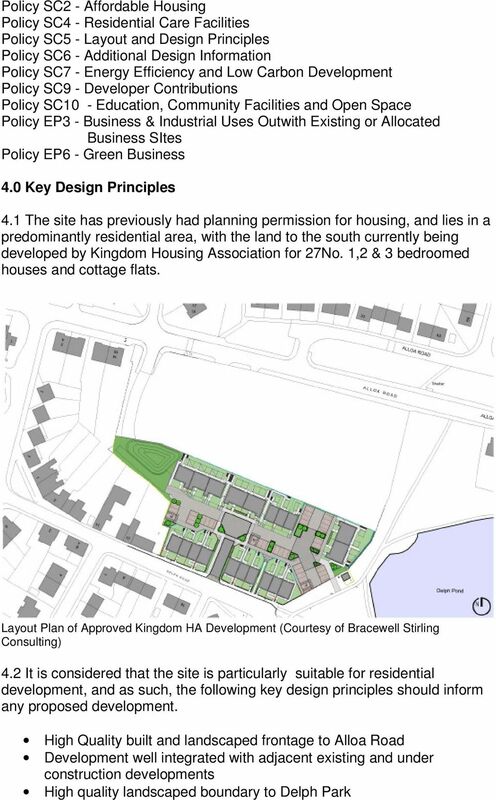 below 20mph without the need for vertical traffic slowing devices but through appropriate layout and design of hard and soft landscaping The approved development layout to the south is considered to represent a suitable template for the layout and design of streets and spaces within this site. 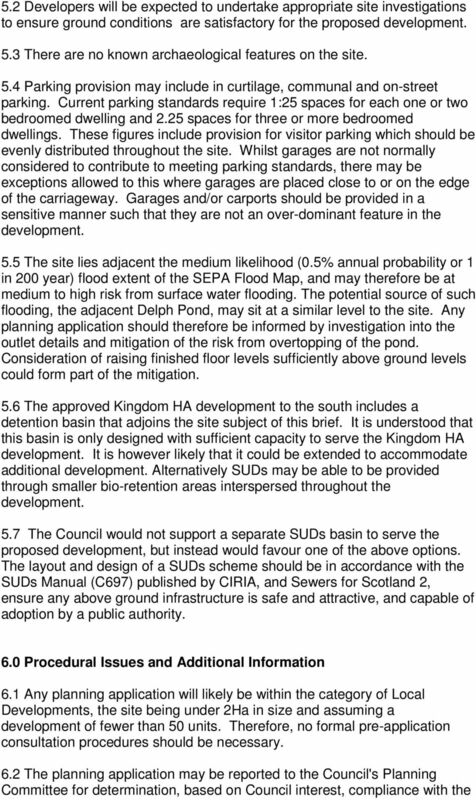 5.0 Technical Considerations 5.1 The Council understands that there are no known mine workings affecting the ground conditions on the site.